Shop Necklaces and Unique Fine Jewelry Collections at Shane Co. Subtle or striking, Shane Co. necklaces make a style statement. Discover the freshest looks from our own designers and top designers around the world, including exclusive styles you can customize with a diamond, ruby or sapphire of your choice. A necklace easily pulls every look together. Shop Shane Co. for thousands of unique necklaces for every occasion and for styles that go easily from day to night. Shane Co. has a beautiful selection of women’s necklaces including timeless solitaire pendants, lockets and pearl strands to layered designs, versatile chains and infinity styles. Choose from sterling silver, white, rose and yellow gold and stainless steel necklaces. Personalize a piece with your birthstone or engrave a metal necklace with a meaningful message. We also carry a wide selection of men’s necklaces from dog tags to everyday chain necklaces in a variety of styles and metals. Does Shane Co. offer different necklace types? We carry a broad collection of edgy, on-trend geometric necklaces and all-metal styles that are perfect for everyday wear. 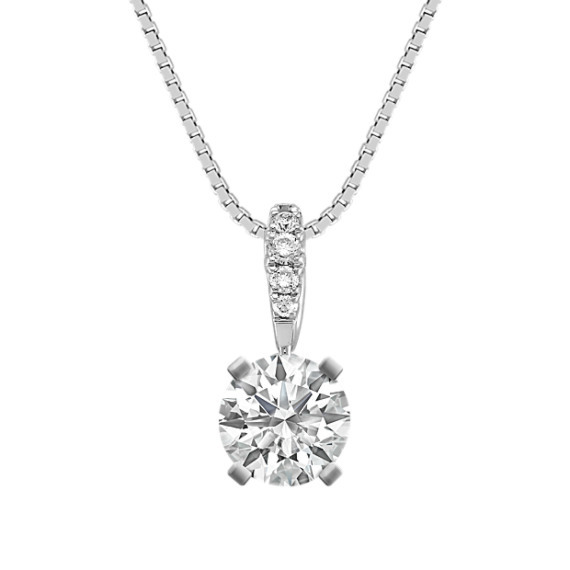 If you’re looking for an attention grabbing piece for a special occasion, treat yourself to a classic diamond necklace or a pendant adorned with sapphires. Browse our selection of dainty necklaces to more elaborate styles and even vintage-inspired designs. Our necklaces are crafted to last a lifetime and only incorporate hand-picked diamonds and gemstones. From religious necklaces to personalized pendants, you’ll find the perfect necklace for every occasion. Do Shane Co. necklaces make good gifts? A necklace makes a perfect gift—whether you’re celebrating a milestone anniversary, a birthday or graduation, we offer a large selection of styles and prices. A gift of a pretty birthstone necklace or a strand of akoya, freshwater pearls or pearls in shades of lavender and pink could be the start of someone’s collection. For something more personal, customize a necklace to make it truly unique. How can I ensure the quality of Shane Co.’s necklaces? All of our necklaces are crafted with quality and covered under a Free Lifetime Warranty. Free maintenance, repair work, cleaning and polishing are all included in our warranty to keep your jewelry looking new, for life.